Vous êtes cordialement conviés à participer, à diffuser et à inviter à se joindre à nous toute personne intéressée par les questions « animales » au cours du temps dans l’espace méditerranéen. Les propositions de communication sont à adresser d’ici le 30 mars 2019. 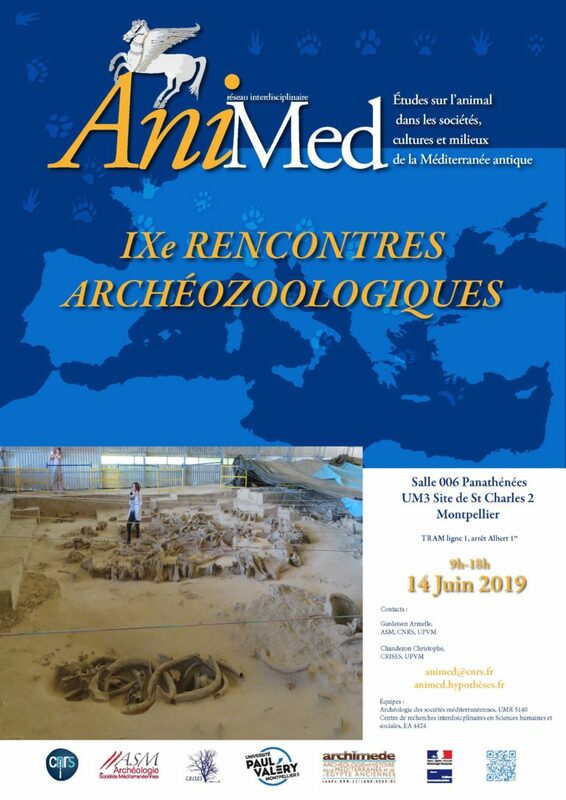 AniMed, an interdisciplinary network for research on animals in ancient Mediterranean societies, cultures and environments, brings together participants from several French and European universities. All the actors in these investigations have a common denominator, the animal : its evolution, its history, its rôle and its place in ancient Mediterranean societies. There is a blend of all disciplines, whether they involve the study of the animal species, covering every family, or are archaeological, historical, palaeo-ecological, linguistic, veterinary, ecological or biological studies. There is no limit on the chronology, which runs from the earliest times of the European Palaeolithic down to the present day, and no restriction on the kind of documentation. Every discipline is invited to join together around the topic of animals, the network aiming to be a meeting place, a support for the scientific information and the diffusion of the work in progress, projects and results obtained by the participating teams (UMR, universities,labex and GDR) and further afield.